You will undoubtedly want to bring back some souvenirs for your friends and family from Russia (and probably for yourself as well), but you don’t want to end up with cheap, low-quality stuff that you’ll regret buying. If you’re looking for nice, unique, and authentic gifts from Russia, there are lots of quality products that you can find quite easily. You’ll recognize these beautifully decorated wooden articles, usually kitchenware, by the red and gold floral patterns painted on them over a black background. This craft dates back to the 17th century; it was originally produced in what is now the Nizhny Novgorod area. The craftsmen there invented the technique of painting in a golden color without using real gold, making the articles affordable to buy and produce. Birches are a typical Russian tree, and birch bark has been used since the 18th century to make containers that are stamped with intricate designs. These make a beautiful gift for anyone’s kitchen; they’re great to use for storing rice, pasta, or just about anything that goes in a jar. You can find these at souvenir markets and some specialty stores throughout Russia. These papier-mâché boxes decorated with scenes from Russian folktales originated after the fall of Imperial Russia. Icon painting was no longer profitable, so craftsmen took up making these decorative boxes instead. You can also find this technique used to make brooches. From the 17th to the 19th century especially, the boxes were widely produced in several villages in the Ivanovo region. The lacquer used tends to be either oil paint or egg tempera. The boxes are great for storing jewelry and other small items. Although it may be difficult to transport, Russian porcelain makes a beautiful gift. The art of making this intricate blue and white porcelain originated in the village of Gzhel nearby Moscow in 1802. All the genuine porcelain you will find in Russia is still produced in several villages in the same area. Amber is fossilized tree resin and makes beautiful jewelry. Originally it came from Prussia, currently known as the Kaliningrad Oblast, and 90% of the world’s amber is still extracted there today. Amber is hugely popular in Russia; there is even an “Amber room” in the Catherine Palace in Pushkin village in St. Petersburg. Amber jewelry makes an incredible gift, but make sure that you’re buying it from a reputable vendor (for example, the Faberge House in St. Petersburg) – plastic knockoffs are common. If you don’t mind buying fur, Russian fur products are some of the highest quality around. Fur coats are of course the most traditional item, but for something smaller you can try a fur stole or a fur hat. Fur stores are abundant in Russia but do double-check that it’s real fur. Russian Malachite is a beautiful rock that is mined in the Ural region in Russia, among other places. You can find it in the form of brooches and other jewelry in many jewelry retailers in Russia. 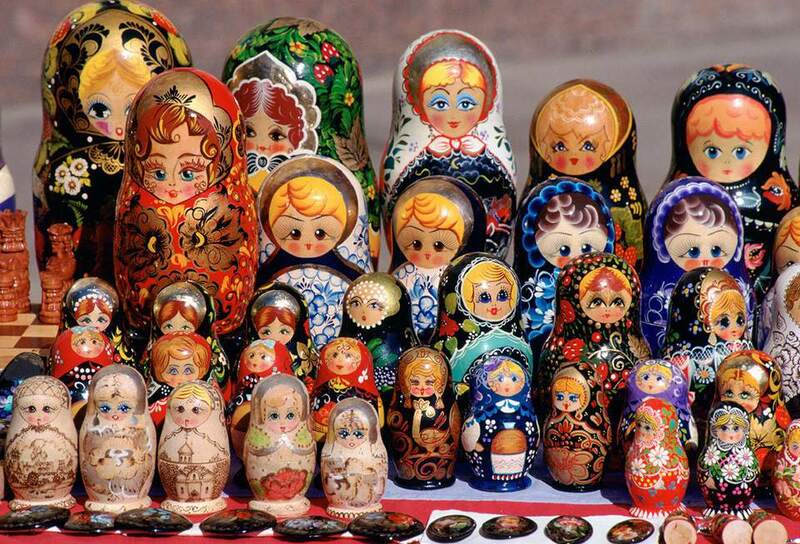 Yes, it’s cliché and stereotypical, but if you don’t buy the low-quality Chinese-produced nesting dolls for sale at most souvenir markets, a nice set of Matryoshka dolls can be a great gift to bring back from Russia. Look for ones that are (obviously) produced in Russia. The best places to find these are at bookstores and specialty stores; avoid the stands at the souvenir markets entirely.